At UNSW, we think of our higher degree researchers as people who are taking one step in a long-term career. For this reason, the UNSW Researcher Development Unit provides professional development opportunities and resources and for UNSW researchers at all stages of their career. The UNSW Research Skills and Professional Development Plan has been created to support your skills and professional development. We encourage you to discuss this plan with your supervisor to develop a targeted approach to your development. For more information about research development resources and opportunities, check out the UNSW Researcher Development Unit page. In addition to researcher development, UNSW also provides a number of events and workshops to support your candidature, as well as University services to help you seek employment opportunities during your studies. Use the toggles below to learn more about these resources. Dates for several events are provided on the right-hand side of this page. The UNSW Scientia PhD Scholarship Scheme is a cornerstone of the UNSW 2025 Strategy, and aims to attract new PhD scholars of exceptional quality to undertake projects in strategic research areas. Scholars take part in an introductory program to facilitate their transition into UNSW. They also have access to up to two planning sessions every year throughout their candidature, along with participation in relevant professional and career development. For more information, visit UNSW Scientia PhD Scholarship Scheme. There are a number of seminars, workshops and events organised by the Graduate Research School and Researcher Development Unit for research candidates at UNSW. These include an induction for newly enrolled research candidates, workshops on key candidature milestones including Annual Research Progress Reviews and thesis submission, a thesis writing boot camp and the Three Minute Thesis (3MT) Competition. These events give candidates the chance to meet, network and learn from peers, colleagues, and members of the Graduate Research team from across the University. For details of upcoming workshops, visit What’s On, or click on the links below. All newly enrolled candidates are required to attend an HDR Welcome and Orientation. The orientation is an important event that provides you with key information to ensure a smooth transition to your research candidature at UNSW. It is also an opportunity to meet your peers, colleagues, and key members of the UNSW Graduate Research team including the Dean of Graduate Research, Professor Jonathan Morris. Offered by the Graduate Research School in conjunction with the UNSW Learning Centre, 'Kick Start your PhD' is a one-day workshop for research candidates at the early stages of their candidature. The focus of this workshop is research writing techniques, and establishing productive writing practices. The schedule includes workshops, facilitated writing activities and extended periods of personal writing time. The Research Progress Review Seminar covers everything you need to know to get the best out of your Review. Staff from the Graduate Research School, the UNSW Learning Centre and an experienced academic staff member will explain who attends your Research Progress Reviews, how you should prepare for them, and the associated policies and procedures. Run by the UNSW Learning Centre with assistance from the Graduate Research School, the biannual Thesis Boot Camp provides candidates with a quiet and focussed environment to write a large chunk of their thesis. Any postgraduate research candidate can apply to participate, but preference will be given to students in the later stages of their candidature. Designed for candidates who intend to submit their thesis in the next 12 months, this twice-yearly seminar provides essential information about thesis submission at UNSW, and the policies and procedures relevant to this process. Staff from the Graduate Research School and the UNSW Learning Centre, and an experienced academic staff member explain the thesis submission process in detail, providing hints on how to get you over the line and help you understand what your examiners might be thinking! There'll be plenty of time for questions during and after the event. 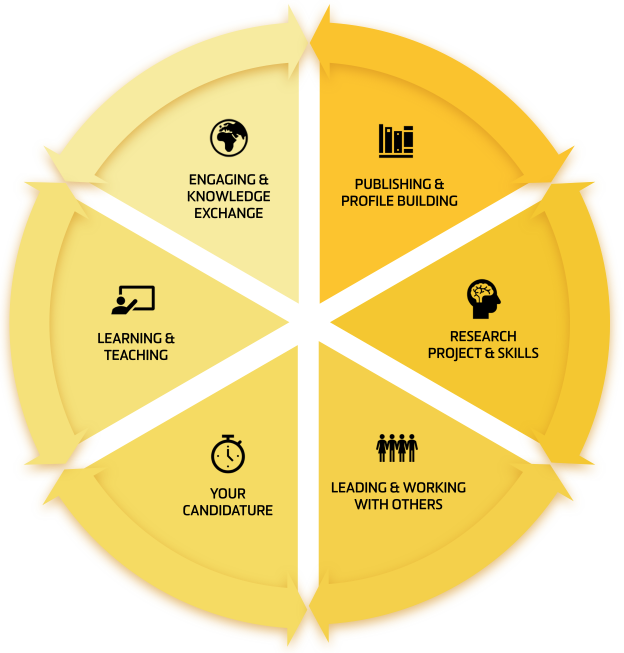 The UNSW Researcher Development Unit (RDU) provides professional development opportunities through contextualised workshops and online resources to support academic career paths from Higher Degree Researcher to Research Leader. You can view a calendar of their events and workshops on the RDU hub. The Three Minute Thesis (3MT) is an academic competition developed by the University of Queensland for PhD and Research Masters candidates. With just three minutes to give a compelling presentation on their thesis topic and its significance, the 3MT competition forces research candidates to consolidate their ideas and crystallise their research discoveries. Visit the 3MT Competition page for further information. HDR Extend Your Career is a holistic, integrated framework and resource designed to help researchers and academics irrespective of their career stage to assess their development needs, identify potential development options, and source these opportunities. For more information, visit HDR Extend Your Career. UNSW Careers and Employment provides services to assist candidates develop career management skills. The unit offers career development programs, career planning and advice consultations, and a number of expos, employer presentations, and seminars. UNSW Careers and Employment has a suite of resources for international candidates for whom English is a second language. The unit offers a professional development program to assist candidates to further develop their communication skills in a professional setting and gain practical workplace experience to enhance their career opportunities. The unit also publishes an International Student Employability Guide that provides helpful career and employment tips for international students. For more information, visit UNSW Careers and Employment. The UNSW Library offers a number of services to assist you in conducting your research project. The Library offers services to support researchers in finding and managing information resources, including a research consultation service to connect you to the information and skills needed to support your research. There are also services to help you disseminate, share and preserve your research output, and to manage and evaluate the impact of your research. For more information, visit the UNSW Library. The Centre's major Research Facilities are accessible to all staff and students of UNSW. Statistical Consulting and Workshops for research candidates. The Learning Centre offers academic skills support to all students across all years of study enrolled at UNSW, including a range of Academic Skills Support for research candidates. Our team are the guide and connector for UNSW researchers and alumni entrepreneurs to people, organisations and their next steps. The Michael Crouch Innovation Centre (the “MCIC”) is an emergent force fostering innovation to create a better world. The MCIC is staffed by a diverse team of highly skilled facilitators, makers, designers, entrepreneurs and networkers, and it is powered by a large and growing community of collaborators across campus, in Australia and globally. UNSW Teaching provides advice, guidance and support to the University, to faculties, to schools and to individuals on the enhancement of learning and teaching at UNSW. Take advantage of their program for HDRs – Beginning to Teach, and Foundations of University Learning and Teaching.